While creating new forms (Shari'ah-compliant standards) to operationalize Islamic values and ethics into the current conventional economic system and banking products is crucial to sustain the Islamic economy as it is today, we also need to develop new strategies to cope with the next economic evolution. The digital revolution in financial services is under way, and digital disruption has the potential to shrink the role and relevance of today's banks, while simultaneously creating better, faster, cheaper services that will be an essential part of everyday life. This forward-looking book discusses the crucial innovation, structural and institutional development for financial technologies (fintech) in Islamic finance. The authors explain concepts in fintech and blockchain technology and follow through with their applications, challenges and evolving nature. The book provides insights into technology which will enable and enhance actual prescribed Islamic behaviors in modern economic transactions. Case studies highlight how to cope with modern transactional behavior with the advent of global online/mobile markets, shorter attention spans, and impersonal trade exchange. "The authors are to be congratulated for this book. It is an important pioneering effort. The work is on the frontier of knowledge in the new area of Fintech. As is well known, the financial sector is suffering from low levels of trust in a trust-intensive industry. Islamic finance too is facing low-trust environment that has denied it the use of the strongest of its characteristics: risk-sharing. As a result, it has resorted to debt-based financing. Blockchain/smart contracts provide potentially powerful tools to address the low-trust challenge. The authors have done a great service to Islamic and conventional finance by producing a book that should be read by anyone interested in finance and economics." -Prof. Dr. Abbas Mirakhor, Holder of the First Chair of Islamic Finance at INCEIF, retired Dean of the Executive Board of the International Monetary Fund (IMF), Washington D.C.
"This is an important contribution by the authors to two emerging fields-Islamic finance and fintech. In this respect, it touches two frontiers as this research could pave the way for the development of both fields. Fintech offers great potential for reaping the benefits of Islamic finance and this book provides an excellent overview of the issues and applications. I am confident that researchers, policy-makers, and practitioners would benefit from this important work." "In this digital era, new technology has proven to bring agility, scalability, innovation, and efficiency in operations and means of doing our work. 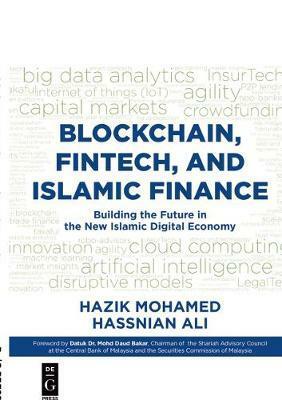 This book argues, persuasively, that the fintech and blockchain applications are not only the channels of fusing technology with Islamic finance; it also lays the foundation for new Islamic digital economy, while keeping in view the Maqasid Al-Shariah. This book is a first-of-its-kind contribution to the literature on constructing the Islamic digital economy." "While the growth of fintech firms has already become a game changer in the conventional financial sector, its application in Islamic economy is still in an incipient stage. The authors of this pioneering work deserve appreciation to not only offer a historical perspective on these exciting developments but also suggest ways to building Islamic digital economy with the use of these tools, especially distributed ledger technology. I would recommend this book to all those who are interested in building a trusted, just and efficient Islamic digital economy." "The authors hit the mark; blockchain needs to become part and parcel of economics, finance and policy across Muslim-majority countries. It is critical for the leadership to understand what blockchain is and its potential application. Islamic economies need to carefully consider the adoption and the potential institutionalization of blockchain across various facets of their economics. The authors lay the groundwork in this book, and it is a must-read for the broad audience whose desire is to focus on a next generation technology, its adoption and implications." --Prof. Dr. Abbas Mirakhor, Holder of the First Chair of Islamic Finance at INCEIF, retired Dean of the Executive Board of the International Monetary Fund (IMF), Washington D.C.
"This is an important contribution by the authors to two emerging fields--Islamic finance and fintech. In this respect, it touches two frontiers as this research could pave the way for the development of both fields. Fintech offers great potential for reaping the benefits of Islamic finance and this book provides an excellent overview of the issues and applications. I am confident that researchers, policy-makers, and practitioners would benefit from this important work."